Get the great look of an entry handleset with two locking points for added security with two-point lock sets from Baldwin, Weslock, and Kwikset. Two-point locks require a key to unlock both the lever or knob and the deadbolt. 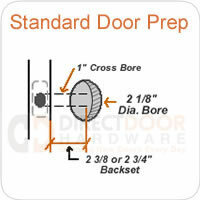 Most 2-point locks will install easily into a standard door preparation with 5-1/2" center to center bores. Please contact us if you have any questions about our two-point locks.